I’ve heard once that Feteer meshaltet’s history goes back to the ancients Egyptians when it was called Feteer Maltoot and it was given as an offering to the Egyptian Gods these days. 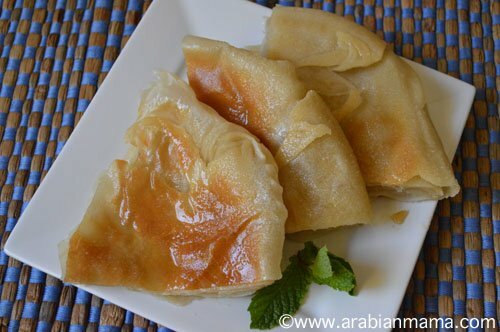 As time went by meshaltet became one of the main dishes in the Egyptian cuisine. 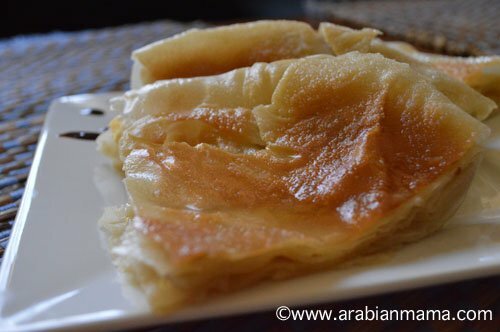 It is said that during the Mamlouk era – which was known for lots of desserts- feteer spread to Europe and was shaped as a crescent which then became very popular as the well-known croissant. It represents generosity and affection. 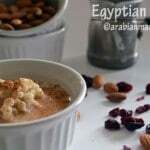 Nowadays, it is a dish that is asked by kings and presidents who visit Egypt. When I visit Egypt you can find so many restaurants making it but the best one in made in the countryside by farmers’ wives. It can be enjoyed in so many ways, so let’s start. 4 cups of white all purpose flour. Melted butter – almost a full cup. 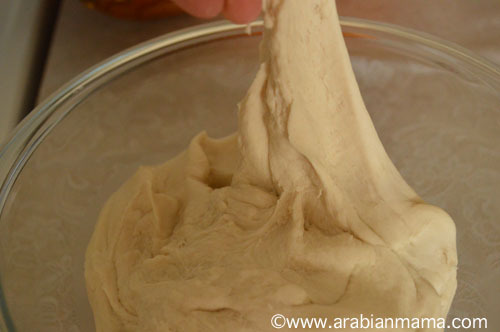 First, mix the flour and salt and add the first cup of water and knead very well then add the remaining bit by bit until you get a dough that is very very elastic so you can pull it and it won’t be torn. Divide the dough into 6 balls, grease a deep dish and put the balls in it then brush the surface with more oil. 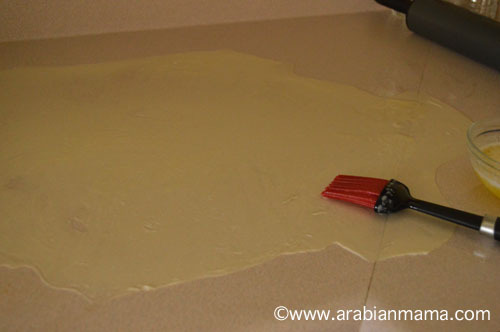 I like immersing them in olive oil so it won’t loose its elasticity and be easier to roll. Let it rest for 15 min. and turn your oven on to the highest degree possible, mine was 550 F.
Start by rolling the first ball to be very very thin that you can see your counter top through, brush the surface generously with melted butter. 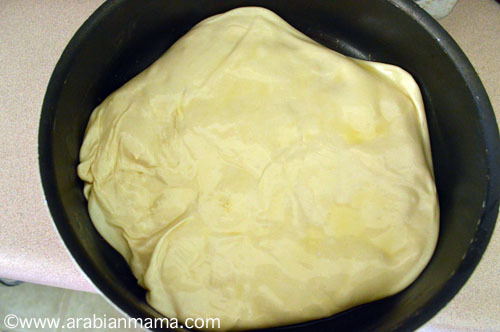 Fold the dough in any shape you like – usually circular- and brush with butter as you fold. Place it aside and start rolling the next ball. Roll the second one and brush as you’ve done with the first ball. 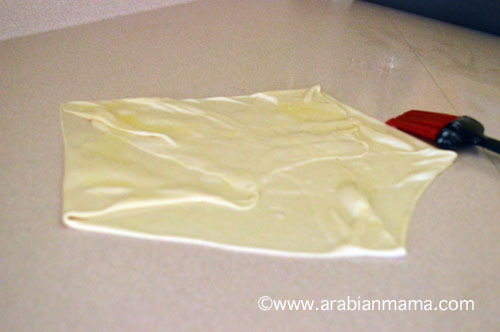 Place the already done one folded side down then fold the outer one and brush with more butter as you fold. Keep doing this for the third ball too then brush all with more butter and place it in your baking dish. Place it in the pre-heated oven for 15 minutes , turn midway. Turn the broiler on to brown it. When it is done add little butter on top and cover so it won’t get dry. We will end up with two rounded babes each made with 3 of the dough balls. Or just sprinkle with powdered sugar, the choices are endless. What do you mean by turn midway? I have ti turn upside down? Or just turn the dish with 180 °? Sara, I meant turn the dish midway through baking. Just rotate the baking dish. I do this because my oven is hotter near the end wall so things usually do not bake evenly. Actually many people complained about this and i think it is a common fault in old ovens?, I am not sure :). Anyways, thanks for your question and I hope you’ll like this recipe. If I dont have an oven, could I do it in a pan on stove to ?????? Sony, although I truly haven’t tried this before but I do not think why not. The only problem I could think of is the inner layers do not get well cooked and stay doughy.Hence, I recommend making two layers only and see from there. You can also make it only one ball, stretch it then fold it on itself then roll it again to the size of your pan and cook over stove top. This will be more like the Yemini bread “malawah” or the Indian Paratha. I hope this answers your question, if you need anymore help please ask and let me know how it went with you. Hey! I just want to know, what is the size of the cup you’re using? Alrette, it is the usual US measuring cup. Let me know if you need any more help. Thanks for being interested in the recipe , I hope you’ll like it. I can’t tell you how excited I am about your blogi LOVE YOUR RECIPES. 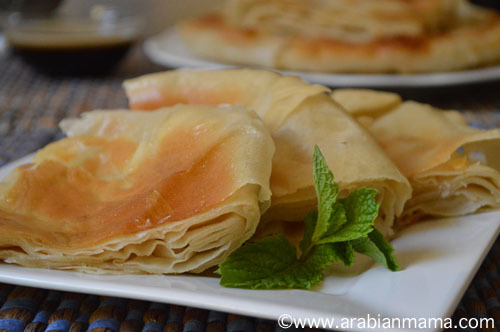 My father is Egyptian but sadly I never learnt how to make any Egyptian cuisine as much as a I love the food. 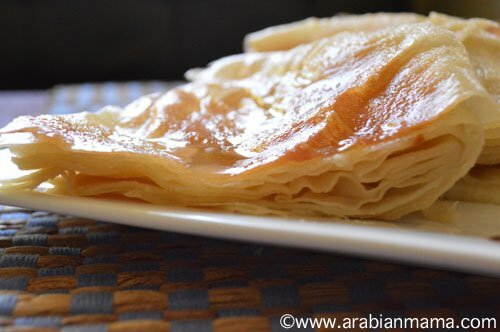 And who does not love feteer my dear :), it is addictive if I may say in all kinds, shapes, stuffing, topping….etc. I’m so glad that you are here and hope to answer all your questions as far as I know. For this recipe I use ordinary all purpose flour… I hardly use cake or bread flour.. just trying to make it simple for everyone. Thank you so much for your kind words. it looks great, thanks for sharing the recipe. can I use same recipe to make cheese or sausage feteer?? If so, do I simply add cheese or sausage between the layers or what? 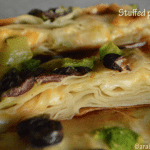 Yes , sure you can if you would like to… Just add whatever you like in the inner layer only then fold it and complete the recipe as is.. 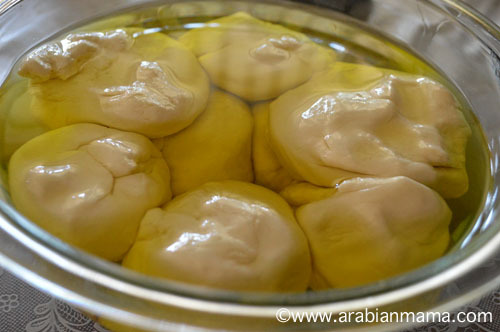 It is very tasty with pizza like filling and it is sold like this too in many different parts in Egypt. 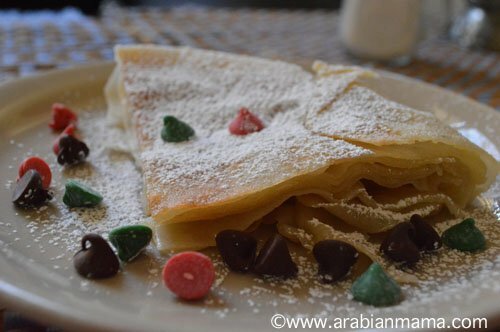 I had this while on vacation in Alexandria and loved it. Thank you for the recipe, I can’t wait to try it! You are welcome, I hope you will like it. And who does not :), I hope you will try this sometime. Thanks for stopping by. These look very nice – so simple but beautifully well made and delicious looking! It is very delicious but it requires a lot of kneading to get the appropriate elasticity of the dough, but this is a breeze with the electric mixers. 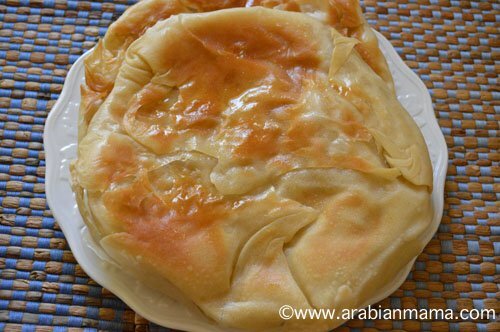 Amira: I love how golden brown and buttery this Egyptian dish is…I wish my hands could reach several slices of it. Mmmm!!! !